Count me in with all the millions of children and adults who love Halloween! Everyone loves the idea of being out on an ominous night with a threatening sky, scary moonlight, and hearing eerie sounds as they go trick-or-treating with friends and family. In our home Halloween is a wonderful time to spend with our daughters creating costumes, carving pumpkins, and decorating our home! It's a fabulous time to let your imagination run wild! That's just what I did this year for my spooky Halloween mantel decorations! Before we start, I would like to give a big welcome to those of you stopping by from Jackie's blog Finding Lovely and her beautiful home tour. She is so creative and inspiring! To all my followers, I'm so grateful for you being here! A special thank you to my friend Janine at Happy Happy Nester for gathering all this talent together for this blog hop. After my blog I will have a list of all the fabulous bloggers on this hop sharing Halloween and fall home decor. But now let's talk about my spooky Halloween mantel decorations! This year I craved a traditional orange and black Halloween. Last year my decor was white, black, silver, and gold. I walked into HomeGoods this year looking for Halloween inspiration! It didn't take long. 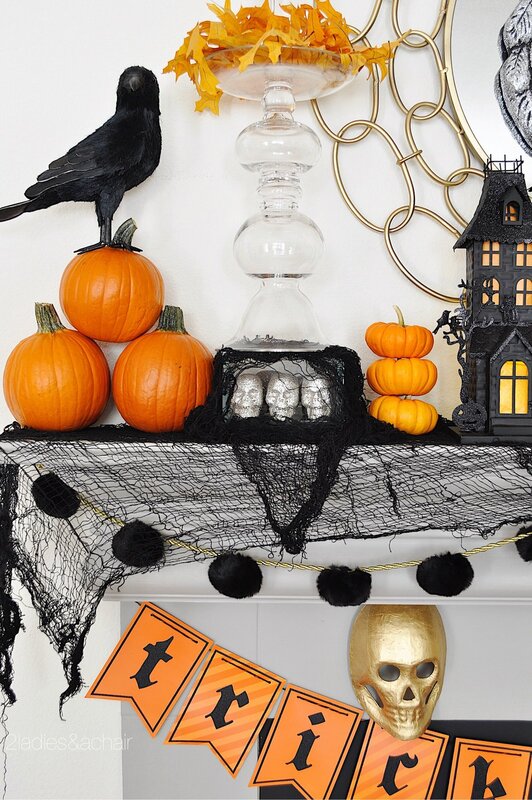 The first decor to catch my eye were these black glitter haunted houses! A haunted house conjures up ghosts, goblins and scary bumps in the night. I added orange tissue paper to the windows in keeping with my black and orange theme. A battery candle lit behind the tissue paper gives a creepy glow at night. I wanted some symmetry on the mantel. Since my candle holders were different heights, I added a clear box of glitter skulls under the shorter one. I love this fun faux fur garland from HomeGoods! It adds a lot of needed texture and interest here. The skeleton masks are made of cardboard that I sprayed gold. The addition of the trick or treat banner with gothic black glitter lettering went perfectly with my spooky Halloween mantel decorations. Pumpkins and more pumpkins, piled up for beautiful bursts of orange! This black glitter owl has a threatening look, perfect for ramping up the fear factor. Crows always remind me of harvest time and Halloween. These almost look real! We live in an incredible neighborhood for Halloween! We average 300 to 400 trick-or-treaters. Our neighbors love decorating their porches with spooky decor. Our street is well lit with big sidewalks and plenty of parking. Parents drive their children over to our neighborhood for a safe family night of trick-or-treating! Honestly we can barely shut the door that night, with so many kids coming. A lot of the parents are dressed up as well and wait on the sidewalk. Our sidewalks are bursting with witches, ghosts, and monsters! I love seeing all the costumes! I'm so happy our neighborhood is Halloween friendly! Most of my decor is from HomeGoods. I have used affiliate links for similar items from this post for your shopping convenience.